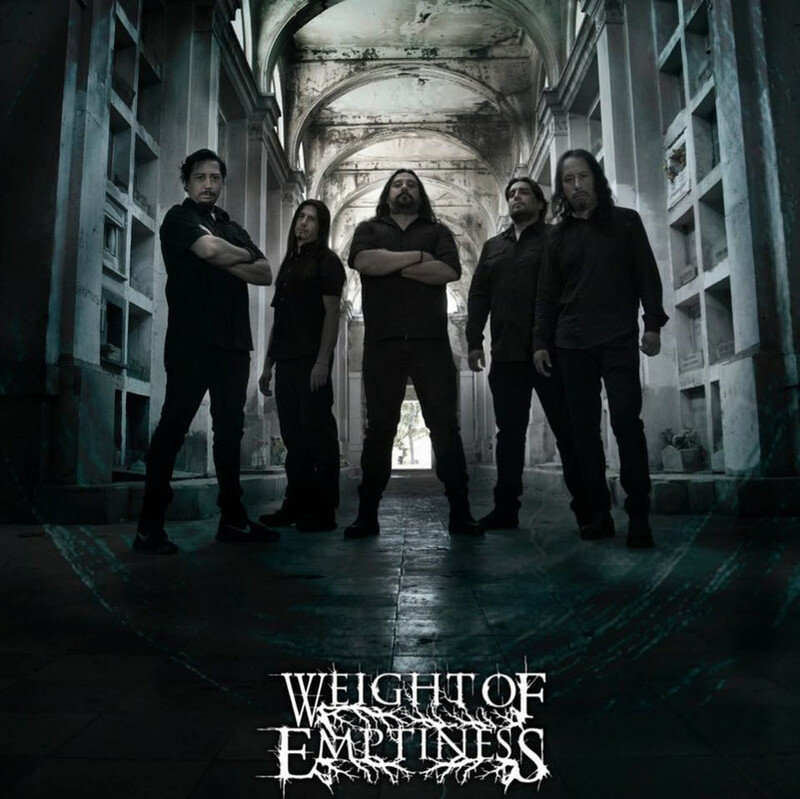 Weight Of Emptiness es una banda de metal que cultiva una mixtura de estilos entre los cuales se distinguen el death, black, progressive y doom metal. Se formó el año 2015 por los ex miembros de la desaparecida banda Twilight Mist, Juan Acevedo y Alejandro Bravo en guitarras y Alejandro Ruiz (Homicide) en voz. Completan la formación Manuel Villarroel en bajo y Mauricio Basso (Letargo) en batería. Cabe destacar la participación en los inicios de la banda del bajista David Hernández, actualmente miembro de la banda Morver. El 4 marzo de 2017 lanzan su LP debut llamado "Anfractuous Moments For Redemption". r Weight Of Emptiness are a self described Avant-garde Death Metal band from Santiago, Chile. What's "Avant-garde Death Metal" you ask? Let's dive in their newest full length album and find out. "Anfactuous" is an instrumental opener that helps set the atmospheric tone for the upcoming onslaught of Metal. "Behind The Masks" stomps in with an immediate tough as nails breakdown. The track features some haunting melodies as it sweeps through the landscape of Death Metal with a tinge of Progressive Metal to it. The guitar solo on the track is absolute bonkers! "Unbreakable" is filled to the brim with Death Metal tendencies. It's a dark track that Death Metal fans will surely eat up right away. The guitar solo on the track is subtle but powerful. "The Silence" is slow and deliberate with its delivery. It pushes and pulls the listener in all directions as it sometimes gets fast and brutal and other times slow and melodic. It's quite the schizophrenic track in all the right ways. "Holy Death" features some tremendous guitar work. The track shines bright as it brings to the table a lot more than just a typical Metal sound. "Cancer" has that signature Doom Metal sound to it. The melody on the track adds great depth and the guitar solos, as always, are always sick. "Weight Of Emptiness" is a great Metal track that needs to be heard as soon as possible. Everything works perfectly on the track and it really transcends what the Metal genre typically consists of. "Inner Chaos" is a nine minute epic track that showcases everything about the band perfectly. If you need to know what the band is capable of, listen to this track. It's nine minutes of Metal awesomeness. "Redemption" is an instrumental closer. The track is a fine example of the awesome talent of the band and really closes the album out on a high note. Weight Of Emptiness smash down the walls of Metal to bring their outstanding form of Metal to the forefront. 1. First off, what's new with Weight Of Emptiness? Hi guys from From The Depths Entertainment, thank you very much for this interview. Well, at the moment with Weight of Emptiness, we are in a new process of composition, while at the same time we coordinate the time with some dates of events within our country. This new process of production of songs is focused on releasing an upcoming album with darker themes in both lyrics and music, compared to the previous album "Anfractuous Moments For Redemption". 2. What's the word on new music? New music videos? As for new music, as I mentioned before, we are directing the album to a more intense theme, with lyrics that border on the darkness of feelings, such as pain and anger. As we are still in that process, we only have structures and demos with the exception of "The Flame", already finished song that will go on this new album and that is already included in the repertory of our shows. 3. What were some highlights in the past year for Weight Of Emptiness? Mmmm ... uuufff ... Highlights of 2017. For me many, listing them would be worthy of a novel, but I prefer to summarize in two major events. The release of the album "Anfractuous Moments For Redemption" and the tour of this same album to Mexico. In short, great! 4. What do you want people to take away from your live show? I think that the band in general, and I hope to be interpreting my bandmates, think that the audience that sees us in our presentations, expects from us a great show, a great performance on stage and that the songs sound with the same intensity as the album. For the same reason, we owe ourselves to those expectations, surrendering ourselves on the stage so that not only the audience that already knows us will continue to be motivated, but rather that public that sees us for the first time, gets involved and wants to know more about us. 5. If someone listens to just one of your tracks, which one best represents you? Woo! Very good question. I know that each member should interpret different songs on this album, but personally to me, "Inner Chaos" represents me 100%, song of which I must confess would be called "In my inner chaos", since the lyrics was written by me and tells a tragic experience that I had to endure and that almost cost me my life. This song goes through many musical nuances, in which we participate in the composition, Juan Acevedo, my guitar partner and me. It's a song that excites me a lot. 6. What's something you'd change about the current Metal scene? What would change in the scene, both nationally and internationally? I think nothing. The metal has undergone many mutations since the 70's, if not further back to reach the extreme and progressive metal that is now, with all its variants and trends. The metal scene is and always will be, both in the auditor and in the one who interprets the music, a reflection of what each person feels and wants to capture. Therefore to be clearer, the metal and its scene is a feedback of who composes music and who feels identified with that music and that will last over time. 7. What are some acts from the Chilean music scene that people should check out? I think that in Chile there are many references of excellent quality, both musically and in their staging. I can name you some: Poema Arcanus (doom metal); Criminal (death metal), Homicide (brutal death metal), Nuclear (thrash metal), Human Vestige (brutal death metal) these last great friends, who are now on tour in Europe. They are some of my taste, but in Chile there is a huge wealth of bands that make metal music. 8. What's next for Weight Of Emptiness? Much work remains for Weight of Emptiness. Compose new songs, keeping in mind that there are already some with their structures defined and many others in the folder. We also need to continue focusing on the visual part of our upcoming productions such as: video clips, lyric videos, etc. In short, a lot of work, the idea is to be able to leave Chile and take our music and culture to new frontiers and because not U.S.A.
9. What do you want to accomplish in the next year? Next year we want to have as our goal the new album in our hands, new tours and try to make our band known to everyone. 1. How did you get started with music and how did you develop your sound? Who thought of the name “Weight of Emptiness” and is there any meaning behind it? Well, that is more general since each member of this band has its own musical trajectory, but it is clear that each one leaned towards the metal and its different branches. Due to this individual mix, they came together in the creation of our music, a mixture of different styles (death, black, doom, prog). Regarding the name, that started in a meeting between Juan and Alejandro (guitar players) when the band was not yet created. Several options were named and Weight of Emptiness was the winner. This is because the name better interprets what music expresses, the internal emptiness of each person in the day to day, of each one inserted in this life system imposed, as also in the existentialist ambit, that space that each one have to think about what we have made of our lives (who we are and where we are going). 2. What do you want people to take away from your "Anfractuous Moments for Redemption" album? Have in your hands a work done with the heart and talent of each of the band members, in which they can hear an aggressive musical style but with many harmonies and sonority in conjunction with the lyrics which go according to the music, expressing that discontent and existential emptiness of life. 3. What's your favorite track to play live? For my part, I love “Unbreakable” and “Cancer”. The energy that is left on the stage is great, and the people who receive it do so with the same intensity that we deliver. Mmmm ... hard to choose only three.... But I would like to go on tour with Sylosis, Alkaloid and Der Weg Einer Freiheit. Same as above, difficult to choose only three! haha ... But I lean for albums that I've listened to all my life and I never tire of listening: Death - "Individual Thought Patterns"; In Flames - "The Jester Race" and Fiskales Ad-Hok - "Anthology" (Chilean punk). 6. What’s your take on the current state of Metal? I like bands wich are already classical and consecrated and they keep playing live and releasing records. I started listening metal music in the 90's and bands that in those years I was astonished, continue doing it today after 20 or 25 years, seems incredible. The new bands are also spectacular, both the Death Tech and the new Black Metal. 7. What’s the current music scene like there in Chile both locally and country wide? In Chile we have a very good scene, high level bands all over Chile. We have been on stage with bands from other places far from capital city, and have a very high level. It is equally difficult for Chilean bands to become known internationally, however Chilean metal is ranked among the best in Latin America. Good death metal bands and doom too. I always download music and it has helped me to meet bands that are not very heard in our country and that is good. I try whenever possible to buy the original if the album I liked. Also, that in pages is available our album for download, is good for the same reason, we reach at countries that only could know us through that way. 9. What’s next for Weight of Emptiness? As a band we will have a mini tour through Mexico (6 dates) in October and a few more shows in our country to close this year that has been spectacular. We are also in the process of composing new songs, in fact, we are working on 4 songs ... so that is a very moved year. Even if someone invite us to play, let's go hahaha. Thanks to all the people who support us, those who accompany us to each show and to the people that sending greetings from different parts. It is gratifying for us to feel the affection towards us. Hail WoE !! !